The most heart-wrenching site is the line of empty graves dug for those refugees yet to drown, a testament to the expectation that the crisis is far from over. At the heights of last summer’s refugee crisis, 15,000 refugees made it to Kos. Most moved on, leaving around 677 today on the island who are in limbo, with little hope that that they can go forward. “What do you think of Ireland?” one asked me hopefully. For sure, they are the less unfortunate than those still trapped in Syria under bombs and siege, but each one had an epic story of suffering and horror. Many are middle class, educated and desperate to work and educate their children. As for so many of these refugees, the system in Europe has failed them. This was the key finding of the latest report of the UK Parliament’s home affairs select committee released this week. It is grim reading for those who believe that richer countries, including Britain, have a responsibility to take their fair share of refugees. At an EU level, the failure is monumental outside of a few states such as Germany and Sweden. EU states have not honoured their obligations and duties to assist southern Mediterranean countries like Greece and Italy, and increasingly appear as if they will not honour the EU agreement with Turkey either. So far, Turkey has accepted back 400 refugees from Greece, but the EU only resettled 177 by May. It is meant to be a one-to-one arrangement. The refugees I spoke to in Kos were terrified of being sent back to Turkey not least in the troubled times after the failed coup. The EU has evaded the issue partially as a result of Turkey’s actions, but more significantly because of the barriers that member states have put up such as on the Greek-Macedonian border. By April 2016, the number of migrants arriving in Greece had dropped by 90 percent. The committee states that the EU was slow to respond, but that is diplomatic speak for not wishing to respond. Many observers expect the deal to collapse. The committee was damning of Britain’s efforts. Belatedly in September 2015, then Prime Minister David Cameron announced that the UK would take in 20,000 Syrian refugees over five years under the Syrian vulnerable persons resettlement scheme. This was a UK-only scheme deliberately to avoid taking part in a broader EU scheme. By March 2016, only 1,602 had been resettled under the scheme, leading the committee to claim that Britain would not meet Cameron’s target. Not only that but, back in May, Cameron told Parliament that Britain would accept unaccompanied child refugees in Europe for resettlement, a pressing need given that Europol estimates there are 85,000 unaccompanied child migrants in the EU, around 10,000 of whom have gone missing, and many of whom have suffered abuse. Different areas of Britain have taken on different loads. Scotland has so far received 610 Syrian refugees, but in London only four boroughs out of 33 have taken some in. Questions are being raised why some areas of Britain have taken almost none at all. The counter argument is that local authorities are facing budgetary restraints and chronic housing shortages. Politics has changed somewhat since the 23 June referendum, won by the Leave campaign largely over immigration fears. Hence the new prime minister only feels serious pressure to reduce refugee and immigrant flows, not the other way round. Britain will remain a major donor country to the refugee crisis (at £2.3 billion) not a significant refugee recipient country. For sure, it is a massive provider of aid but, as the committee states, this “does not absolve the UK from also providing more direct support for the thousands of Syrian refugees who have already arrived in Europe, particularly those whom the UK government, in different circumstances, would consider to be vulnerable and therefore deserving refuge". For the time being, there is a lull in the refugee crisis in terms of numbers pushing to get into Europe, but not conditions of the refugees. Sources with UNHCR, the UN's refugee agency, were clear with me that they see this as temporary and that a further crisis in the eastern Aegean was only a matter of time. The lack of a proper system of controlled relocation means that it will be the people smugglers and criminal networks - who run an industry currently valued as much as €6bn - that will profit, taking increasingly dangerous routes that will expose refugees to even greater dangers. 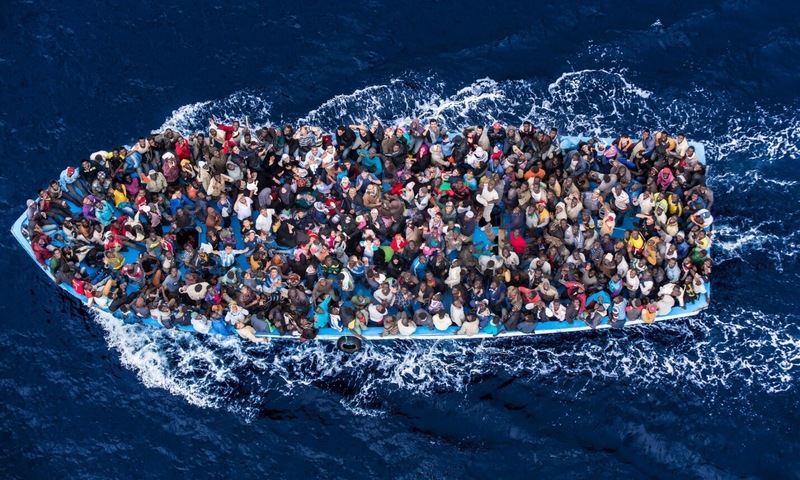 Europe is simply not prepared, but even worse, seems incapable of responding effectively. Frontex, the EU border agency, is woefully lacking in resources and qualified staff. Considering that there are an estimated 500,000 people waiting to cross the Mediterranean from Libya, this should focus minds at some point. EU states at the borders of the bloc are clearly at a terrific disadvantage, and in this case, it is Italy and Greece who need assistance. For example on the Greek islands, the Greek authorities need 740 Frontex staff to manage the hotspots, the refugee welcoming and processing centres, but so far only 100 have arrived. The EU had also promised to relocate 160,000 migrants out of the million who arrived in 2015, but as of 15 March 2016, only 937 had been moved. This failure is mirrored in the UK by a coast guard totally ill-equipped to monitor the smaller ports that migrants are now targeting across the English Channel. Only four of the new coast guard vessels are properly deployed. The refugee crisis in Europe is tiny compared to that in the Middle East itself, but still this rich continent is lamentably failing at every level to honour its legal and moral commitments. Jordan, Lebanon and Turkey may not have treated the refugees perfectly, but given their limited resources and the millions they have accepted, Europeans should feel ashamed. The rise of far right anti-immigrant parties in Europe, fuelled in part by Islamic State-inspired atrocities, has only made matters worse. But building walls and barriers is not a solution and Europe cannot become a fortress. The future of the EU itself, not least the Schengen agreement of open internal borders, is very much at stake. Britain may be exiting, but it cannot evade and flee from this issue. The time for an effective, joined up strategy, properly resourced and backed by political will, is long overdue. For those who dismiss this complacently complaining that the refugee crisis has peaked, one only has to look at the brutal siege of Aleppo to see where the next wave of refugees may come from. The crisis may only just be beginning not least due to the failure to end the Syrian conflict itself, the greatest failure of all.